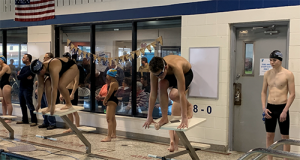 BERLIN- After practicing and working out in the pool all winter with his teammates, Stephen Decatur freshman swimmer Alec McCabe last week got a chance to compete in an official meet against real competition. McCabe, a freshman at Decatur, has autism, but that has not deterred him from enjoying the same things as many of his classmates including competing on the school’s varsity swim team. Week in and week out, and almost day in and day out, McCabe has spent much of his time in the pool, training with his varsity teammates, but he never had an opportunity to compete in a meet until last week. McCabe’s team captains and coaches waited all season for the right time to get him into a meet and that opportunity came last Thursday against Cape Henlopen. Although it didn’t count in the overall team standings, McCabe made the best of opportunity with a strong performance in his heat. Jill McCabe praised Alec’s teammates for their compassion and understanding, and perhaps more importantly, for including him in their final regular season meet of the season.